There’s an important yet overlooked ingredient to performing your best on standardized tests! 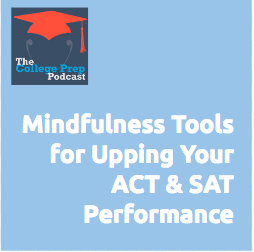 In this episode, guest expert Logan Thompson details how to apply some simple tools from the world of mindfulness to turboboost ACT and SAT performance. Check out Logan’s book Beyond the Content here on Amazon. Feel free to access these sample mindfulness recordings at Logan’s SoundCloud. After earning his MBA from Vanderbilt University, Logan Thompson pursued his passion for mindfulness by moving to a meditation center, where he lived and practiced for over two years. He then began teaching test prep for Manhattan Prep, a unit of Kaplan Test Prep (he has a 99th percentile score on the SAT®, GMAT® and GRE®), where he still teaches. He is also an adjunct professor of mindfulness at Endicott College and a Master’s student at Harvard University, studying Human Development and Psychology. Feel free to email Logan at LoganJThompson [at] Gmail [dot] com. Click here to listen in now! Most students forget to do this when studying. They might review their notes or text book, but they forget practice “retrieving” it from their brain (which means looking away from the source of the information and testing yourself to see how much you know). 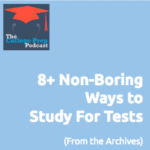 Tune in to hear 8+ non-boring strategies for putting this technique into action, just in time for final exams (for some of you) and for the new semester (for the rest). Note: This podcast was originally published on May 15, 2015 as episode 53. Click here to listen in to these studying tips! It’s finals time for many students around the country and world! Are you freaking out? Self care during this stressful time is super important, and recently I ran across this awesome resource. It’s an infographic for how to take care of yourself during finals. You can go to the inforgraphic directly by clicking here. Or… check out this video where I walk you through it, and make some commentary about some of the suggestions. What are your favorite ways to take care of yourself during stressful times?